These two metal tags have been hanging around my parents' house for years. One of them is stamped "N. G. BACON | Bethel | Me. | 1871," and the other "J. W. MORTON | 40 MONROE ST | LYNN | MASS." The designs of the tags are similar, but not identical. The Morton tag is more heavily worn. The metal is non-magnetic. I found a J W Morton in Massachusetts who was a brick maker. Bricks might be something that are "hanging around the house". Other than that, I'm out of ideas. For once I'm not being facetious: I really don't know what these tags were for, or who J. W. Morton was. My mother has had them in a drawer for about 20 or 30 years. Can anyone figure it out? There is a James Morton listed in the 1870 Census living in Lynn, Essex County, MA. Apparently the same James Morton is listed in the 1860 Census in Rockland, Knox County, ME. He is a Master Mariner, which at first I thought might be related to the tags. But I can't make a link to N. G. Bacon, the bootmaker. Could the bootmaker have later become a seaman? Could the tags have something to do with bootmaking? As far as I know, Nathaniel Green Bacon never went to sea. I don't believe I've found him in the 1860 census, though. I did wonder if these were some sort of luggage tag, used on a train or ship. They look something like advertising trade tokens or key tags. An exonumist might be able to id? I found a similar tag here: http://www.arago.si.edu/index.asp?con=2&cmd=1&id=216. Apparently some kind of railroad mail/baggage tag. Mark, that must be it! Thanks! Mark Roy was on the right track I think. Thanks to him I had fun learning about Owney the Postal Dog. 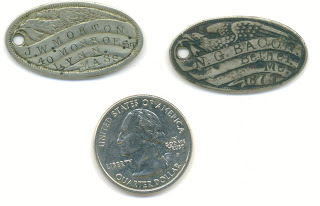 Many of the tags Owney collected were advertising tokens. I think the tags you found are from a penny press type machine like these. I have no idea if you caould set the machine to type out your own name or if they only rolled out the name of the business where the machine resided. You know, Apple, my mother had a similar theory-- that these were something that one could have personalized at a fair or carnival. Their shape is very similar to those produced by penny press machines, but more uniform than most of those shown here. Wikipedia says the first "elongated coins" weren't produced in the U.S. until 1893. There are more examples of these tags on the site that Mark found, here, here, here, and here. Thanks to NevadaGenealogist for introducing me to the word "exonumist." I'll try to work that into conversations this weekend.